Homecoming–a weekend that is filled with family, friends, good food, and, for many this past Saturday, football. After the long and anticipated wait for the opening of Shadek Stadium, Saturday marked the start of a new era for the future of F&M Football and the school as a whole. As parents, alumni, students, and spectators came to watch and tailgate Saturday afternoon, everyone was in awe at the beauty of the new stadium. Striped turf, a huge jumbotron, and a sky box with incredible views–a stadium that set a new precedent for DIII school’s around the country. 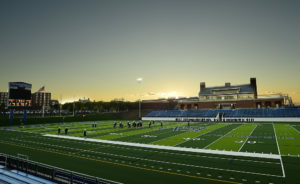 And while Shadek Stadium has now set F&M apart from many other DIII colleges, the F&M Football team, however, has similarly set themselves apart from their competition. Clenching a 56-0 win over the Dickinson Red Devils, F&M showed no mercy as they fed off the energy from fans. Within minutes of the game, F&M took a 7-0 lead, moving 58 yards on 10 plays, when F&M’s quarterback Tanner Erisman ran in from four yards out to set the tone of the game. With touchdowns from F&M’s Pietro Gaspari, Jeff Leone, and Erisman, again, the Dips totaled a score of 28-0 at the end of the first quarter. At the start of the second, F&M’s Taalib Gerald continued to bring the Diplomat heat with three touchdowns in the stanza. He scored on runs of 19, four, and six yards, bringing the Dips into the half with a 49-0 lead–the most first-half points in Centennial Conference history. F&M’s Eric Harris added one more to the board in the fourth, with a 10-yard run that closed the day with a score of 56-0 and a Red Devil shutout. Defensively, F&M gave Dickinson a run for their money. The line held the Red Devil offense to only 11 yards and four first downs, with an astounding minus nine yards on the ground. With five sacks, two fumble recoveries, and two interceptions, the F&M defense was led by Joe Granahan who totaled seven tackles and 1.5 sacks in the game. Keeping control over the Conestoga Wagon Trophy for the second straight year in a row, the Dips improved their overall record to 6-1, while the Red Devils dropped 2-5. The Dips return to action next Saturday at Moravian at 1:00 PM. Sophmore Gabby Goodwin is the sports editor. Her email is ggoodwin@fandm.edu.